Twice in the last two months, I have joined friends on multi-day paddling trips in southern Florida. The first (in late December, 2017) was to the shoreline southeast of Goodland. We were in the area in the quadrant of the storm with the strongest on-shore winds. The second was the Florida Keys near Big Pine Island in April, 2018. We paddled at Cudjoe Key where the eye of Hurricane Irma passed over the Florida Keys and 6 other places the quadrant of the storm with the strongest winds up to Marathon. Just this week, this week (April 17), several preliminary reports from NASA on Hurricane Irma damage in the Everglades were released, so it seems like a good time to share some general observations with you. On both trips, I was particularly interested in the hurricane damage, variation in degree of damage, and in any signs of recovery. Some things were apparent: red and black mangroves in the Keys appeared to have suffered the most. On the Atlantic side, almost all were dead. The area had few white mangroves. Buttonwoods, where present, appeared to have had better survival than red or black mangroves. On the bay side, exposed mangrove islands had near total mortality. Sheltered mangrove islands and shallow mangrove flats with small trees had good survival. Hammocks adjacent to the beach had little to no regrowth. Hammocks in higher, inland areas seems to have survived fairly well. Coastal shallows along Big Pine Key. Both red and black mangroves were mostly dead. The coastal hammocks, common on the islands near Goodland, were also very hard hit, and at least in December, seemed to have near total mortality. 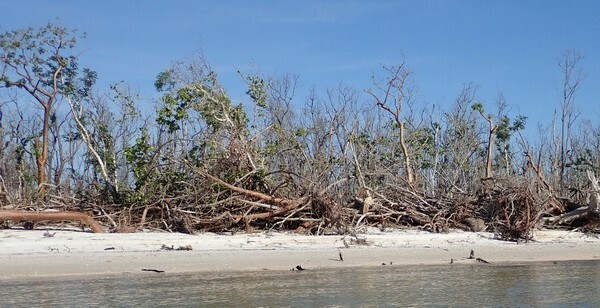 While mangroves near Goodland had substantial mortality, there were usually a few live trees even on the coast and more on islands inland from the coast. The beaches in the Keys had taken a different hit – the beach sand had been swept up and dumped inland often leaving exposed rock along the former beach and the beach sands piled inland forming new dunes. Most of these dunes were clearly not welcomed as they had buried roads, buried coastal hammocks, covered former landscaped areas, and wreaked havoc in parks, natural areas, and seaside residential and commercial areas. NASA has done some overflights of the Everglades in recent weeks doing aerial photography and using LIDAR, some of their initial results have been published. Their results show broad patterns of damage consistent with the casual observations that we made on our paddle trips. In some cases, the cause of mortality was obvious. In areas where the trees were likely exposed to storm surge and strong waves, many mangroves had been toppled or uprooted. But in many others, the trees were denuded of leaves but still standing – and very dead. Along these same coasts, there was little evidence of new mangrove recruitment. Even slight shelter from the winds, however, apparently provided significant protection even in areas that had clearly experienced high water. In the Keys, we went to an area (near Marathon) where there is an extensive, mostly red mangrove, swamp with tunnels running through it that provide access for kayaks. On the exposed edges, mortality was nearly total. However, there were areas inside of the swamp where there was almost no mortality and many young healthy recruits. Around the islands on the Florida Bay side of the keys, the islands where there was little wind protection had much greater damage than in areas where there was some protection. Areas where all of the mangroves were small and better described as shrubs than trees, often had many live and apparently healthy red mangroves. This led me to look at easily accessible scientific studies on causes of mangrove mortality from hurricanes. I found lots of studies on patterns of mortality – after Andrew, Wilma, and other major storms. Only a few looked at mechanisms of damage and factors that will likely affect recovery. Those few focused on red mangrove. There is some data on some physical factors likely related to mortality. It is limited since equipment has a high failure rate when exposed to the extreme conditions of hurricanes. Unbeknown to me, storm surge heights are apparently difficult to measure (for instance, see Miami Herald, Sept. 21, 2017, http://www.miamiherald.com/news/weather/hurricane/article174681556.html), and the water height varies with location – a water level on one side of an island would not be the same as the level on the other side. In the Florida keys, the area between Cudjoe Key and Marathon likely had the highest storm surge (Needham, Sept. 12, 2017, http://wxshift.com/news/blog/irmas-wild-coastal-floods-storm-surge). Both cited articles suggest a storm surge between 4 and 6 ft in the Cudjoe to Marathon area, but I saw no data for the Florida Bay side of the islands. Various reports for Goodland (observations but no data), suggest a 2-3 ft storm surge. Wind gauges break, and most mangrove swamps don’t have gauges in them. This storm moved sand and reshaped islands. Depths of blown away and deposited sands are measured only in a few places, and even less would be known about redistribution of finer materials. Definitive studies have not yet been published, and it is likely that NASA’s LIDAR data will be the best available in terms of above-water land surface changes. 1. Most of these mangrove forests will not recover quickly. The scientific literature suggests that red mangroves cut or broken near the bottom do not resprout. 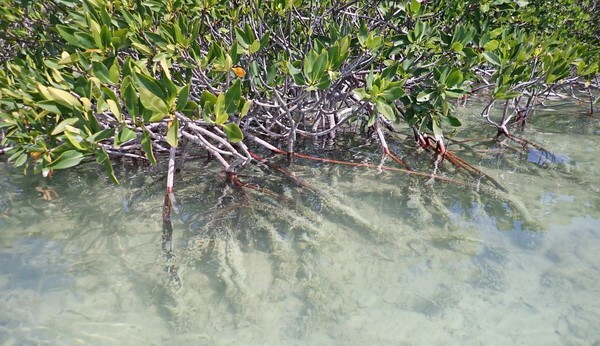 Salinity control and aeration in red mangrove roots depend on energy produced by photosynthesis. With no leaves, there is no source of energy, a factor that likely leads to lack of internal salt control and mortality. Roots can also be smothered by fine materials. 2. Lack of propagules will slow recolonization. 3. There may be more mortality over the next few years. 4. Locations of mangrove forests may shift. Several studies, in particular (Cahoon et al., 2003, https://besjournals.onlinelibrary.wiley.com/doi/full/10.1046/j.1365-2745.2003.00841.x) have found that in areas of mass mortality and significant organic content in the mangrove swamp soils, the soils experienced subsidence after mortality, while in areas where survival was high, accretion occurred. On Big Pine Key, our group also observed that some bays had silted in which could lead to new areas suitable for mangrove colonization (or not, depending on silt content). Large areas near Cudjoe Key and Boot Island (near Marathon) have the potential to become centers of recruitment since they were dominated by small mangroves with good survival. 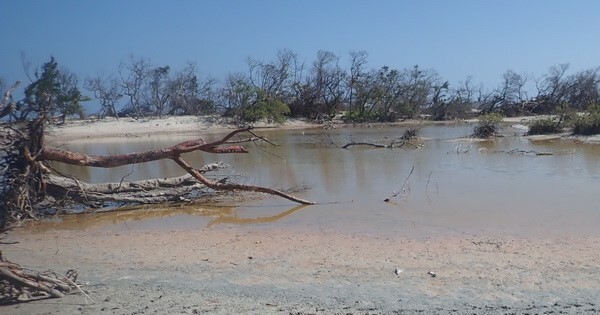 Some reports suggest that some of these same areas may have developed initially as an aftermath of the 1935 hurricane which apparently eliminated extensive areas of black mangrove swamps. 5. Indirect effects, such as pollution and sea level rise will likely affect regrowth. A 2004 Smithsonian sponsored study in the Indian River Lagoon after it was hit by hurricanes Francis and Jeanne found that pollution increased growth rates of black mangroves but made them more susceptible to wind damage. Sea level rise will likely affect the distribution of areas with appropriate water level ranges for mangrove establishment. 6. The coastal hammocks looked like they might recover fairly quickly where the majority of the trees were still standing. We saw new leaves on many trees in coastal hammocks in the Keys. However, there could be shifts in species composition especially if there was extensive soil erosion or sand deposition. Where large numbers of trees were blown down, recovery will be a long process.